Happy Birthday, Mr. Fortieth President! In a belated birthday wish, a reminder of how morally obtuse Ronald Reagan could be. I missed a friend’s birthday a couple of weeks ago. 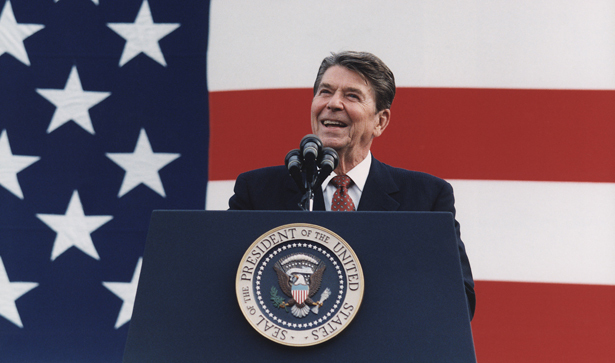 February 6 was the 102nd anniversary of Ronald Reagan’s birth. I’ve been spending a lot of time with the old fellow, as some of you know, working on a book, and I really should make amends. Because he astonishes me. A man as myopic as what you’ll be seeing below really deserves some sort of recognition. He really, really does. I went on Google Newspapers, typed in “Delta Queen” and “fire.” And learned…she had caught on fire little more than two years earlier. And what did he offer as his evidence, in 1978, that these “relaxed” measures were acceptable? Ironically enough, a Gallup Poll citing 80.6 percent support for his government. Back in 1975, meanwhile, the first time Gallup came calling in Santiago, by public law the military junta could banish anyone they wanted, and keep them “in detention in locations other than regular prisons”—such as, infamously, the national soccer stadium, where some 40,000 political enemies had been held. By private law, thousands of regime enemies were simply “disappeared,” including an Air Force official, Alberto Bachelet, who was tortured to death in 1974 (the papers reported he died from cardiac arrest in a basketball game). His daughter and mother were picked up for detention and torture six months before this Reagan broadcast. Would you speak truthfully to a stranger bearing a clipboard in a country like that? Apparently Ronald Reagan never thought of that. Gallup said Chileans loved their ruler, and that was good enough for him. Put simply, there were good guys and bad guys. Augusto Pinochet, vociferously anti-Communist, was one of the good ones. Call it a preview of what was to come, ten years later, when he called the proprietors of another set of death squads, the Nicaraguan Contras, “our brothers,” “the moral equivalent of the Founding Fathers and the brave men and women of the French resistance.” Happy birthday, Mr. President! Even expanding preschool education, which is shown to boost later academic performance, will be a tough sell for Barack Obama with this Congress, Rick Perlstein writes.